Songs of Eretz Poetry Review is pleased to present “Equinox” by Ron Wallace, the winner of the 2017 Songs of Eretz Poetry Award Contest. His bio may be found here: http://eretzsongs.blogspot.com/2017/01/announcing-winner-of-2017-songs-of.html. a broken promise of rain. as they spiral into the coming of cooler nights. 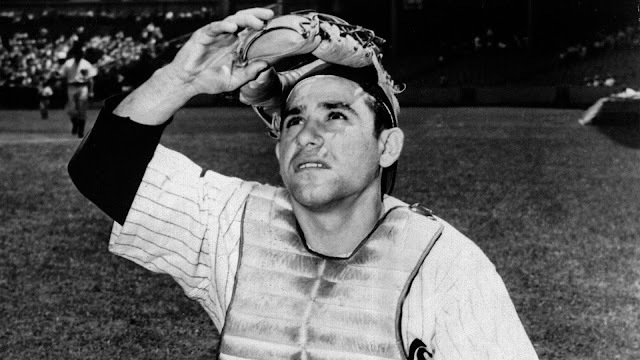 Poet’s Notes: As the autumn equinox was approaching on February 22, 2015, the great New York Yankee Hall of Fame catcher Yogi Berra (pictured) passed at the age of 90. That started the thoughts that became this poem. This changing of seasons from summer to fall always moves me to reflect on the passing of youth. Berra, being a childhood favorite of mine, exiting this plane as summer and baseball were drawing to a close, brought me a longing for more summer, more youth, more time. Editor’s Note: I enjoy the mood Ron creates here as well as the interesting comparisons between weather and baseball. He captures many competing feelings here, not least among them the ambivalence we have for change, competing with the powerful feelings generated when we experience the exact moment of change.